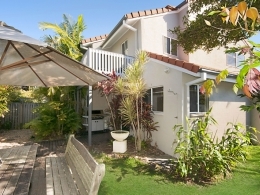 Waitui, the Fijian word for ocean, is a beautifully appointed, 3 bedroom, 2 bathroom, fully self contained townhouse in the heart of Byron Bay. 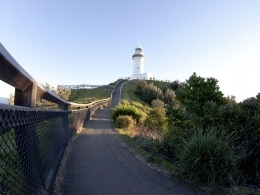 Only 250m stroll to the CBD and 400m to the Main Beach. Waitui has a welcoming feel, bathed in sunshine all day long. You can enjoy relaxed alfresco moments with friends dinning on locally hand crafted furniture. A private tropical landscaped garden is complete with BBQ, outdoor shower, plus a secure garden area for children to play. 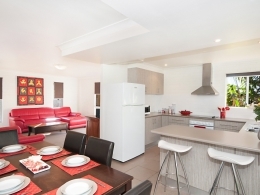 Accommodating up to six people in comfort, the main bedroom features a queen sized bed, en-suite and private balcony. The second bedroom offers a queen with 2 single beds in the third bedroon, both have access to the main upstairs bathroom and balconies. Linen and bath towels are provided, all you need to bring are your beach towels. 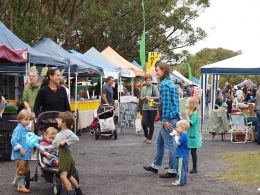 Waitui is directly opposite the famous Byron Bay Markets held on the 1st Sunday of every month, and each Thursday morning the local farmers market sells the most amazing organic produce. Cars are not needed while staying at Waitui, with everything at your doorstep including restaurants, cafes, pubs and supermarket. Longer beach walks to Clarkes Beach and the Lighthouse all start from your holiday home at Waitui. Overall Waitui offers its guests a beautifully furnished private garden townhouse in a fabulous location.